Lucknow Metro Rail Corporation (LMRC) today organized a special interactive session titled “Conversation with Shri Alok Ranjan” in association with Lucknow Management Association (LMA) at the Transport Nagar Metro Depot. The Lucknow Management Association’s Vice-President, Shri Arun Kumar Mathur along with Shri Alok Ranjan, Ex-Chief Secretary of Uttar Pradesh Government & former president of LMA and 60 member LMA delegation were welcomed and felicitated by Shri Kumar Keshav, Managing Director, LMRC and other senior officials at the Transport Nagar Metro Depot. The programme began with a safety presentation and orientation session at the workshop conference room. The programme was followed by a Depot visit by the LMA officials Shri Arun Kumar Mathur and Shri Alok Ranjan along with MD, LMRC, and others senior officers of Lucknow Metro. The delegation visited all the necessary working centers/functional units like Inspection Bay, Depot Control Centre (DCC), Operations Control Center (OCC) etc. which are vital for the daily operations of Metro trains in particular and working of the Metro system as a whole. During this visit, they also took an overview of the Operations Control Centre (OCC) from where train movement is tracked and monitored in real time. The LMA officials felt quite satisfied with the working and operations of OCC which make the Lucknow Metro system even more secure and safe for the commuters by catering to state of the art technology of the inbuilt Surveillance system. 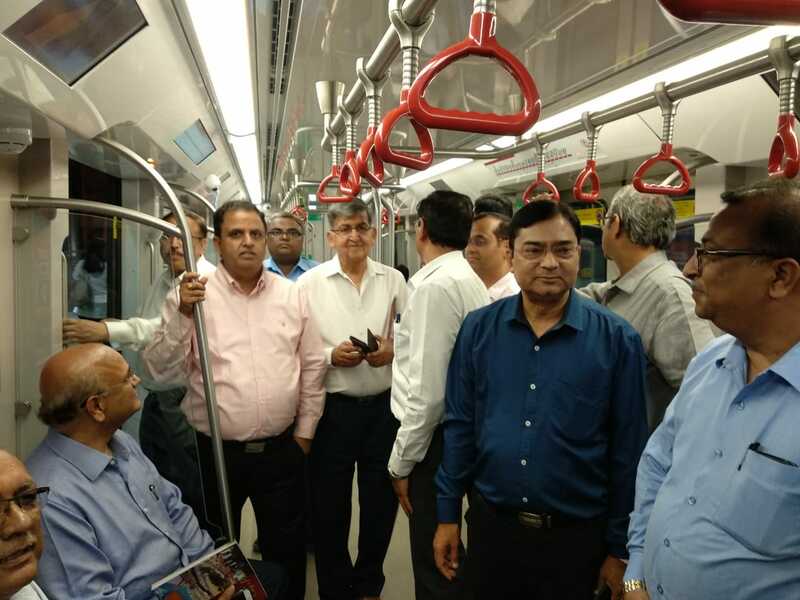 The programme concluded with a special Metro train ride for the LMA delegation comprising Shri Alok Ranjan and Arun Kumar Mathur and other LMRC officials to and fro Transport Nagar and CCS Airport metro stations.